With one of the most significant Iron Bowls in recent memory right around the corner, I thought we could take a look at how each team has performed against a set of common opponents: Mississippi State, South Carolina, Arkansas, LSU and Ole Miss. Each of the tables contains the actual game statistics against each opponent as well as three averages: all games, home games and road games. Notice that Auburn’s toughest opponents (LSU, Arkansas and South Carolina) have all been home games for Auburn, while these same opponents have been road games for Alabama. Likewise, Alabama’s easiest opponents have been home games, and these same opponents (Mississippi State and Ole Miss) have been road games for Auburn. This fact accounts for the large differences in home/away performance statistics but also serves to make Alabama’s home dominance a little easier to understand. Auburn is outscoring the common opponents by an average of 40.4-26.4 per game, while Alabama is outscoring the opponents by a 23.8-19.8 average margin. At home, Alabama is outscoring opponents 26.5-10, while in road games Auburn is outscoring opponents 34-22.5. Auburn is outgaining opponents 482-369 this year in all games, while Alabama is outgaining opponents 374-341. At home, Alabama is outgaining opponents 386-271, while on the road Auburn is outgaining opponents 460-327. On a per-play basis, Auburn is outgaining opponents 7.13-5.90, while Alabama is outgaining opponents 5.99-5.44. At home, Alabama is outgaining opponents 6.53-3.92, while on the road Auburn is outgaining opponents 6.63-4.99. Auburn is outgaining opponents on the ground 327-133 this year in all games, while Alabama is giving up more rushing yards than it gains by a margin of 128-136. At home, Alabama is being outgained 138-141, while on the road Auburn is outgaining opponents 267-168. Auburn is giving up passing yards at an average rate of 154-236 this year in all games, while Alabama is surpassing its opponents by an average of 246-205. At home, the Tide’s margin grows to 248-130, while on the road Auburn is actually outpassing opponents 194-158. Greg McElroy and Cam Newton are about as different as two quarterbacks can be, but both are among the best in the SEC, if not the nation. For as much hype as he has generated, Newton has accounted for about 60 percent of his team’s offense in all games (65 percent at home, 52 percent on the road). McElroy has accounted for about 63 percent of his team’s offense (61 percent at home, 64 percent on the road). As a side note, Newton has been responsible for 39 of Auburn’s 61 touchdowns (64 percent). McElroy has accounted for 16 of Alabama’s 39 touchdowns (41 percent). Put in terms Alabama fans can begin worrying about, Cam Newton has scored as many touchdowns as Alabama’s entire team — offense, defense and special teams combined. The table above and chart below show average game performance ratios. For example, Auburn is averaging 40.4 points per game to Alabama’s 23.8. This equates to a 1.7 to 1 ratio in favor of Auburn, which is represented as 169.7 percent in the table above and the first blue bar in the graph below. Examining the chart below, you can see that Auburn is relatively consistent in its performance relative to Alabama at home and on the road. Comparing yards per play (offense and defense), neither Auburn nor Alabama has struggled with teams from Mississippi, though Alabama’s relatively stronger performance against these teams may be attributable to its home-field advantage in both these games. Against the upper echelon of the SEC (LSU, Arkansas and South Carolina), we see a few differences. Both Auburn and Alabama teams played South Carolina very evenly on a per-play basis, with both teams outgaining the Gamecocks simply because they ran more plays than Cocky (Auburn 78-57, Alabama 64-57). Against Arkansas, both teams struggled mightily in pass defense. Auburn and Alabama each gave up about 7.3 yards per play against Arkansas. While both teams ran comparable number of plays on offense against Arkansas, Auburn allowed Arkansas to run 77 plays on offense, while Alabama allowed 58 plays by Arkansas. Against LSU, Auburn and Alabama’s performances were very different. Both teams in both games ran a comparable number of plays (about 66). Alabama averaged of 5.0 yards per play, allowing 6.7 yards per play. Auburn, however averaged 7.7 yards per play and allowed a mere 3.6 yards per play. When Auburn and Alabama meet Friday afternoon, they usually say you can throw everything you know about these two teams out the window. I suspect this is less likely to be the case this year as each team knows how to gameplan for the other. Both teams will likely be relatively conservative in their play calling, with Auburn favoring the run and Alabama favoring the pass. Auburn’s pass defense has been the team’s Achilles’ heel all season long and you can bet that Alabama will have a solid gameplan built around quick passes to limit Auburn’s pass rush. When Auburn has the ball, expect the unexpected. Offensive coordinator Gus Malzahn undoubtedly has a handful of trick plays he has been saving for the Iron Bowl, and with Auburn’s rushing attack leading the way and setting up regular “second and short” situations, the playbook will be wide open. 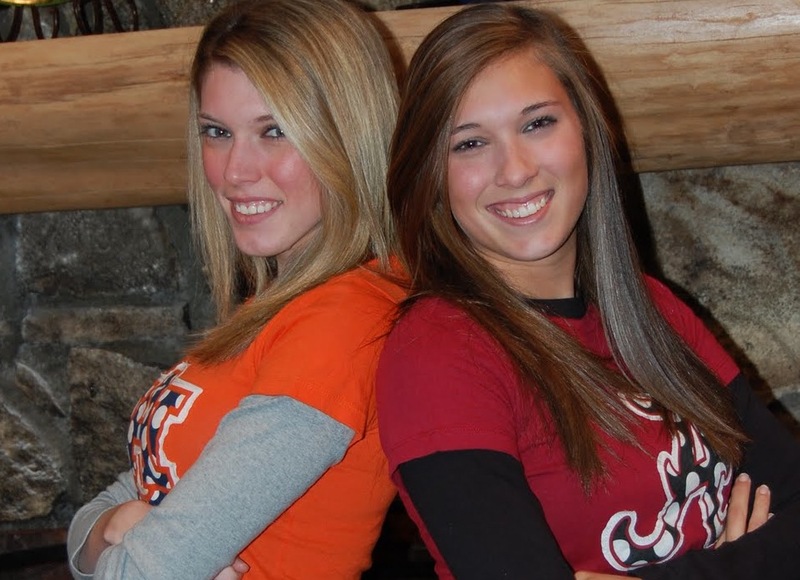 No idea who the two girls are, but the Auburn one is definitely better, lol. There’s just somethin’ about that orange and blue on a girl. Oh, and this: “Put in terms Alabama fans can begin worrying about, Cam Newton has scored as many touchdowns as Alabama’s entire team — offense, defense and special teams combined” may be the funniest and most inspiring quote I’ve read surrounding this Iron Bowl, yet. We comin’. And God2illa is coming with us. Oh well, it’s still funny. The fact that it took their game against Georgia State (I still refuse to call them “GSU.” They may have held the title longer, but when it comes to football, “GSU” = Georgia Southern. The team with 6 National Championships) to even it up just makes it funnier. The fact that ‘Bama even played that game is an embarrassment. Can’t wait for Friday. I’ve got a really good feeling about this one. I just hope I’m right. War Eagle! And GATA Eagles! for my GSU Eagles in the 1st round of the FCS playoffs on Saturday. Believe me, it is not going to be easy. Just do it Tigers. Its going to come down to McElroy vs Fairley and Newton Vs Hightower. Take your pick. I say AU by 10. The stat that shocked me was Alabama’s rushing yds at home– less than their opponents’ yards! Wow. Bama has some serious issues on the O-line and their backfield D is young, plus their front 7 are not generating much pass rush. I’m really more worried about the Sakkerlina game in Atlanta, really (Alshon Jeffrey is terrifying; Julio is good but he’s no Jeffrey). I agree with Van – the stat about them being outrushed is shocking. Two great running backs and that great defense and they are getting outrushed, especially at home. That is not good when one of the best rushing teams in SEC history is coming to town….. Especially when you consider most of their tough games have been on the road! If they couldnt outrush Duke or whoever, heaven help them on Friday. I remember a lot of talk in the off season and early in the year from a certain fan base that said Auburn didn’t belong in the SEC. I’m ready to stuff those words down their throat!